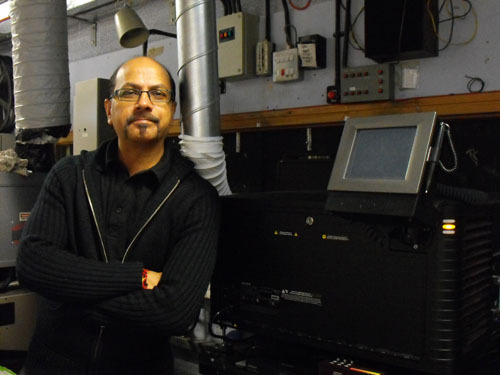 Jas Kapur has had a long career in cinema and film projection and has become recognised for his skills locally and nationally. 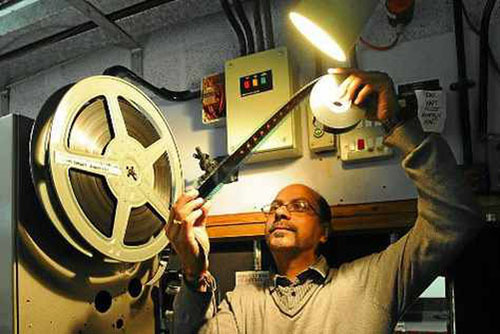 This started in 1979 when he was taught all the skills of the trade by his inspirational mentor, Chief Projectionist Dave Tambling, growing up in a world of cinema at the ABC Cinema Wolverhampton. This involved handling and learning about all aspects of 35mm film and being trained to very high standards to embrace all levels of technology, equipment, maintenance and showmanship necessary to deliver the magic of cinema in all its forms. He later joined Light House in 1991 where his real prowess was to be realised, bringing his unique skills and passion for creativity, inventiveness and problem solving, he forged a career in this field and helped influence the direction of the industry. Making his personal mark, Jas helped test the boundaries of evolving technologies such as the introduction of Digital technology and satellite transmission of Alternative content, coming onboard right from the start when the technologies were first emerging in the industry. Working with heads of the deliverers of NT live and More2Screen, suppliers of Royal Opera House content, he helped iron out early teething problems from this medium and assisted many independent cinemas in embracing these new technologies as well, as offering advice for installation in their own venues. In fact, this was all happening before any of the big chains had access to this new content. Other proud achievements include the building up of great personal relationships with the University of Wolverhampton and the lecturers of the Film Studies modules delivered at Light House right from the beginning. Running everything from 16mm, rare archival 35mm film to modern Digital, the students have benefitted from a unique learning experience and screen presentation over the years. When Audio Description was first introduced to cinemas it made it possible for visually impaired customers to enjoy cinema too. Through a personal friendship with one of Light House’s regular visually impaired customers, Dr Denholm Wright, Jas has helped push the boundaries and availability of this technology. Supporting campaigns and applying industry pressure, he helped iron out problems arising from this technology, when it was first introduced. Jas has always been an ambassador for the Black Country using his knowledge and expert practice of Audio Visual technologies and event management to bring many great events to the region. As Centre Manager at Light House, he was instrumental in bringing first The Deaf Festival to Wolverhampton in 1997. This well and truly put The Black Country on the map for the deaf community with people travelling from all over the country and internationally to attend the annual festival. This showcased deaf awareness and nurtured the celebration of deaf talent through film making and creativity. It has evolved positively over the years, changed name and is run now by the great team at Zebra Uno, but remains to be delivered annually by Jas at Light House.